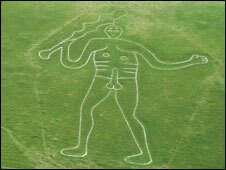 First it was a shortage of sheep, now the wet summer has been blamed for obscuring Dorset's Cerne Abbas giant. Conservationists have been invited to help re-chalk the 180ft (54m) ancient fertility symbol, which has become obscured by vegetation and moss. The situation was worsened by a shortage of sheep farmers lending their flocks to the National Trust. The figure will be re-chalked between 13 and 20 September and people nationwide can take part. Rob Rhodes, National Trust head warden for west Dorset, said: "The grass is now pretty much smothering the whole of the giant. He is not completely invisible but he is quite overgrown. "Throughout the history of the Cerne Abbas Giant it has been maintained and looked after by residents and locals of the Cerne village. "It's a chance to keep that tradition going and help locals carry out the maintenance work." Many people believe the figure is a symbol of ancient spirituality and fertility. The trust usually borrows about 100 sheep in May and September to graze the club-wielding figure, which dates back to 1694. The last re-chalking was in September 2001 but it was brought forward to this year because of the erosion caused by the wet summer. Mr Rhodes added: "How many ancient monuments around Britain do people get the chance to help maintain? The giant is on a par with St Paul's Cathedral and Stonehenge." People need to contact the National Trust direct to get involved, although Mr Rhodes warned that the weekend slots were already oversubscribed.